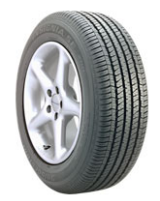 The Bridgestone Insignia SE200 tire combines solid all-season traction with great value for the budget minded driver. The tread design of the SE200 gives it a 65,000 treadwear life as well due to a unique L.L. Carbon black. The tire itself features a symmetric design and UNI-T technology to go along with a silica added tread compound. This combines to give this Insignia better overall performance on rain soaked roads with lower risks of hydroplaning. The all season capabilities of this radial tire allow for good handling and stability. The Insignia SE200 tire ranges in price from approximately $50 for a 13″ series to a little more than $100 for a 17″ series tire. Who Are Bridgestone Insignia SE200 Tires Designed For? Bridgestone has designed the Insignia SE200 for owners and drivers of sedans and economy type vehicles. Due to its lower price and higher value, it’s also a good option for the budget conscious. Bridgestone Tires backs up the Insignia SE200 tire with a 5-year or 65,000 treadlife warranty. There is also a first 1/32″ of wear uniformity guarantee and a 5-year materials and workmanship warranty. It calls for free replacement for the first 3 years, followed by a prorated amount over the final 2 years. Finally, Bridgestone has a 30-day buy and try it guarantee as well.